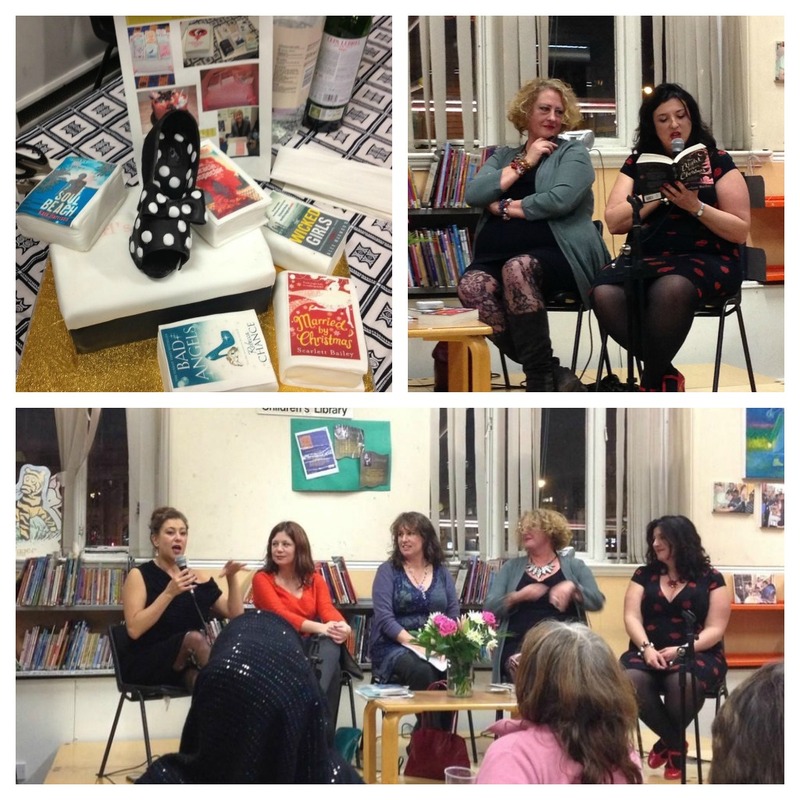 On Wednesday 5th December 2012 I traveled to Brixton library for ‘A Christmas Girls Night In’. The event featured five fabulous female authors reading from their novels, some of which were Christmas themed. The event also featured cake, wine and nibbles, only making it even more exciting than the prospect of meeting some amazing writers! Having never been to Brixton, or indeed the library before, I found it to be an impressive building, and was welcomed with open arms and a glass of wine and I knew I was going to be in for a wonderful evening. I took my seat with the other book-addicts and the authors arrived one by one, being given a suitable introduction by the organizer of the event. First to take to the stage was Rebecca Chance, followed by Kate Harrison, Helen Smith, Alex Marwood, and finally, on came Scarlett Bailey AKA Rowan Coleman. The five of them settled themselves on the stage and began to each take a turn to read an extract from their book. First to read was Rebecca Chance who read an extract from her latest festive novel Bad Angels. I was part way through reading this book, having been given it at the Simon and Schuster event back in October, and so I was quite excited to hear the author herself reading from it. I think hearing her reading part of the book to me gave me a whole new outlook on what I was reading. She talked about why she had chosen to include the characters that she did, why she wanted to set the book here and how she had come up with the title of the book with her publishers. Rebecca chance completely brought the book to life, and I found myself reading the final half of the book with added vigour, having heard what she had to say about it and particularly after hearing her reading it aloud including the Russian accent of one of the characters. You can hear what I thought of the book in my festive review! Kate Harrison was next to read. I have read all of Kate Harrison’s 'grown up' books, but she chose to read an extract from one of her young adult books, ‘Soul Beach’. She talked about how these books deviate from her normal genre of ‘women’s fiction’ because she included a kind of Facebook for dead people, and writes sometimes from the perspective of a serial killer, which she admitted she found quite exhilarating. I found it really interesting to hear that she had felt the need to deviate to a different kind of fiction, and that she felt it had as much to do with her age as it did to do with the fact that she had written so many books in the other genre and felt she had to write from a different point of view, with a different kind of love story and some meatier other stories. I would be interested in giving her ‘Soul Beach’ series a go after hearing her read from it. Helen Smith and Alex Marwood were authors I hadn’t heard of before I arrived at the event but I thoroughly enjoyed hearing extracts from their writing. Helen Smith is an author who is local to Brixton and her writing reflect the local area and local culture. She said that people familiar with the area will recognise a lot of the landmarks and locations from in and around Brixton. Her extract from her latest novel ‘The miracle Inspector’ and indeed extracts from her other novel had the audience gripped, and got quite a few laughs, so she is another author who I may explore in the future as I found her to be highly entertaining. Alex Marwood, like Kate Harrison, has also grown tired of writing in the ‘Women’s fiction Genre’ and so has turned to writing crime fiction. Earlier in the evening Rebecca Chance had read an extract from her book featuring prostitutes and Alex also chose to read a scene from her book ‘The Wicked Girls’ involving a prostitute, except this scene was a lot less care-free than the scene in ‘Bad Angels’ and featured a murder taking place. You could have heard a pin drop as she was reading, the tension built to a wonderful crescendo and we all applauded when she finished the extract-another book to look out for if you are looking for something to grab your attention in the new year! Finally Scarlett Bailey introduced her new book ‘Married by Christmas’ which I have just begun to read and will be reviewing shortly, but chose to read an extract from her earlier novel ‘The Night before Christmas’ featuring a group of friends in a cottage in the Lake District struggling to fit a too-large turkey into a too-small oven. Again there was much laughter, and I was mentally making a note to get hold of this book, and add it to my collection of Christmas reads for the rest of December! Rowan AKA Scarlett Bailey also talked about the recent Romantic Fiction award she received for her latest book ‘Dearest Rose’. She said that as she had got older, her writing style had changed slightly and that was why she had tackled the risky subject of domestic abuse in this novel. She talked about asking Facebook friends to share their experiences of domestic abuse with her, and then afterwards getting messages from them, having read the book, about how well she tackled the issue, and how she had done justice to their stories. I found this to be really touching. She said that she had decided to write books like ‘Married by Christmas’ as Scarlett because of the increasingly serious nature of her more recent novels as scarlet, she felt she needed to differentiate the more ‘fun’ Scarlett novels from the now mire ‘mature’ novels which she wrote as herself. The authors were asked questions afterwards including their favourite Christmas moment, Rowan Coleman said that her favourite moment wasn’t actually at Christmas but was on New Year’s eve four years ago when her husband proposed to her in a hotel room as fireworks went off outside. There was a collective ‘aww’ from the audience at this point. The authors were also asked about their writing process which is always an interesting subject for any would-be writers in the audience. They all agreed that they gave their characters a lot of thought, some created biographies or back stories for them, and Alex said that for every 100, 000 word novel she creates, there will be at least 50, 000 words of back story to go with that where she has developed the characters and where they have come from. They also talked about the benefits of reading their novels aloud as part of the editing process, Rowan noticing her overuse of the exclamation marks in her novel, and Rebecca adding an extra simile to her extract as she typed it out to read at the event. They referred to the fact that Dickens used to read the dialogue in his writing into a mirror before her actually committed it to paper, and perhaps this is something that they ought to try in the future. All in all, it was a really great event. I loved hearing the authors read their own work, it was a pleasure to get to meet them all, the cake was fabulous, and most of all I have come away having discovered two new authors, and a long list of book I absolutely have to read! Thanks for this lovely write-up of the event. It was a brilliant night, wasn't it - great audience and well-organised and hosted, as always, by Marie at Brixton Library.